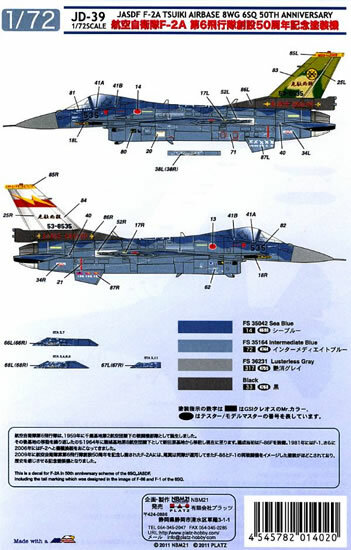 A nice single subject sheet for the Hasegawa 1/72 F-2A kit. 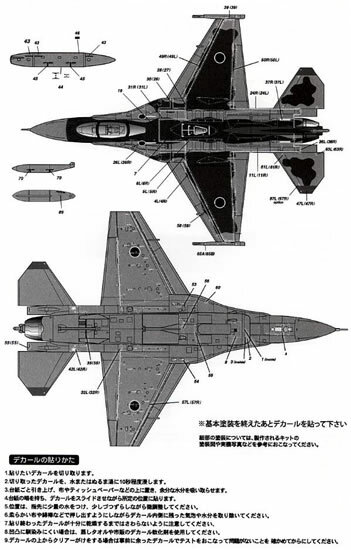 The Japanese Air Self Defense Force (JASDF) is well known for elaborate and interesting camouflage and commemorative schemes. In the case of the F-2A this combines both traits, with the interesting blue sea camouflage applied across the F-2 fleet and some of its preceding Phantoms, and a commemorative scheme for 6 Squadron, 8 Wing marking its 50th Anniversary in 2009. In this case the markings were designed to call to mind the schemes carried by the Squadron’s earlier F-86F Sabre and F-1 aircraft. This is achieved by the port fin carrying the camouflage of the F-1 and the starboard side the silver fin with red stripe and yellow lightning bolt of the Sabre. Further the left finlet carries silhouettes of all the squadron’s pervious types including what appears to include the F-86, T-33, F-104 and F-1, whilst the starboard finlet documents the development of the Squadron’s tail markings. In Japanese terms it is a somewhat restrained presentation for such a scheme but is clever in touching on key points in the history of the unit. Unfortunately the text supporting the instructions are entirely in Japanese and this prevents a more detailed understanding of the scheme being developed. The decals themselves appear to be a collaboration between an organisation called Natural Born Modellers 21 (NMB21) and the well known Japanese model company Platz. 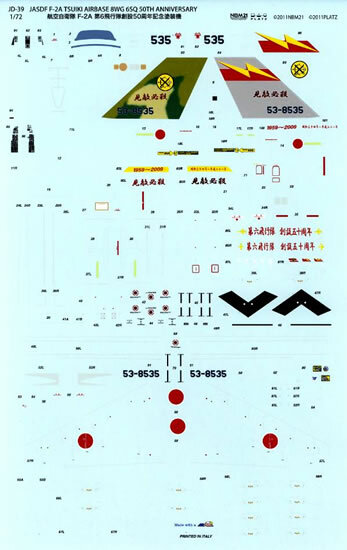 It consists of a single A5 sheet and a double sided instruction sheet to show camouflage and demarcation. The tail fin markings are provided as single complete decals as are the wing walk stencils. The latter is surprising and results in a large area of clear decal sheet covering each wing. The same applies to the wing pylon markings. Although this will undoubtedly make application easier, it also increases the risk of silvering or other problems in application. The printing is sharp and generally in register, although the small red filler cap markings for the drop tanks appear a little off centre. The decals themselves are printed in Italy, probably by Cartograf and this is a virtual guarantee of ease of use. Overall NBM21/Platz has produced a nice sheet of an interesting subject, with my criticisms being ones of presentation. Even a non-Japanese speaker will of course be able to make full use of this sheet.